- New video options such as mipmapping, clear water, better grass, better fog, etc. - New dimension with unique mobs, items, dungeons, equips, tools, weapons, and much, much more! by LostKingpin - Adds two new cat and fish mobs. - Allows you to build your own custom flying ships using a controller block. Adds dozens of new thins such as dungeons, buried treasure, hanging vines, minerals, ores, stones, colored wood, and tons of new weapons and tools. - Adds new weapons to the game while staying true to the original minecraft feel. Some of the weapons include, halberds, spears, knives, battle axes, warhammers, javelins, muskets, blowdart guns, crossbows, dynamite sticks, flails, and firesticks. Premium Wood: Adds new tree types, each with its own colored or textured wood, different from the normal trees. Every new type of wood can be crafted into items and other blocks just like normal wood, only each one will have its own colors which greatly increases the opportunity for decoration. NetherCraft: Greatly improves the Nether by adding new things such as Nether specific vegetation and giant tree-like-mushrooms, new items, tools, and weapons crafted from things found in the Nether, new mobs, and other things in order to make the Nether survivable. Auto-Mod: Auto-Mod is a small utility that will allow you to install multiple mods or a single mod on Windows computers with one click!. ReefMantas: Adds a new water mob to the game along with new water related features. The reef mantas can tamed, ridden, fed, and grown from their eggs. BiomeWater: Makes water act similar to grass/leaves and change color from biome to biome. The color file can be customized. Visit the thread for more! - Incorporates a new aspect to the game in the form of archaeology by adding things such as fossils, ancient relics/ tools, stoneboard legends, plants, and ways to create dinosaurs from the fossils you dig up using analyzers and cultivators. Many more new features coming soon. - A great sound mod which adds new atmospheric sounds to the game such as: blowing wind, nature sounds, cave sounds, ocean sounds, lava sounds, and much more. - This makes doors as useful and versatile as possible without adding any new blocks or items by allowing doors to change according to where you place them. They can be used as fences, windows, diagonal doors, half doors, shutters, gates, and much more. - Adds multiple new uses to strings such as crafting them into ropes which can be used as ladders, trapeze lines, ziplines, placebale cloth sheets which can be used as carpets or tents, and rope bridges. - Adds an assortment of new steampunk related items and blocks to the game such as electric lamps, light bulbs, new ore blocks, new weapons and armor, metal trees, lamp blocks, chisel tools, drills, copper wire, and new building blocks. - Utilize the flux capacitor to create your very own minecart Delorean (or pig) as a way to travel back in time to to the Jurassic period in order to experience and fight your way the gigantic forests and vast landscapes filled with dinosaurs of all shapes and sizes. - Adds baby animals to the game for each of the oriignal animals which can be tamed to follow you, fed to grow to adult size, and much more. -This adds a lot of stuff. New mobs, new ores, new biomes, new dungeons, rpg aspects, magic, portals, and new items. The mod contains dozens of new spells, mobs, items, and dungeons. - Lets you play as the creeper. You can control other mobs, blow yourself up, kill human builders or miners, and reek havoc among the land. - Adds more creatures into the game, including lions, rabbits, cats, deer, wraiths, bears, werewolves, boars, birds, foxes, sharks, ridable dolphins, horses, pegasai, and wolfs. 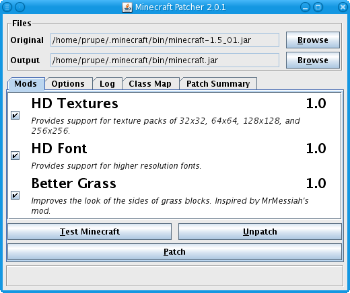 ModLoader: A popular tool used by modders to allow compatibility between mods. You will needs this for most mods. AudioMod: A popular tool used by modders to allow the usage of custom sounds. Elemental Arrows: Adds 5 new arrow types that can be crafted in game, each with it's own special power. Recipe Book: This item when used opens up a GUI of every recipe that can be done in the game, including recipes for any mod you have installed. Shelf: This block allows you to add up to 9 items to it and the items you put in are shown in the world. Biosphere: A new generator that creates massive spheres encased in glass domes and connected with wooden bridges. Each sphere contains unique environments and biomes. Armor Stand: Incorporate a block that allows you to stand your armor on it and use it as decoration. Light Sensor: Adds a new craftable block that is a new input for redstone mechanisms. Floodgate: Adds a floodgate block can be used as either a floodgate, allowing toggleable water and lava falls, or as a trapdoor. More Stackables Beta: Makes food and other items stackable, and fixes a few other bugs. Spawner GUI: Each spawner now has an option for which mob they can spawn, controllable ingame. Sign Tags: Adds features to signs such as displaying time, x,y,z coordinates, and changing messages using reddust. Death Chest: If there is a chest in your inventory when you die, items from you inventory will fill it up and the chest will be placed at your death spot. BiomePack: Makes stone, sand, gravel, sandstone, and cobblestone act like grass/leaves and change colors from biome to biome. They each have their own color maps which can be edited and each one can be toggled on/off. Coral Reef Mod: Adds colorful coral reef formations at the bottom of the sea. More Trees: Adds 4 new tree types to the game, each one with its own special purpose, including palm trees, apple trees, banana trees, claimable vines, giant sequioas trees, and cherry blossoms. Diary Products + Food Mods: A series of new cooking items and ways of making food, including things such as cheese makers, butter churns, pans, chocolate bar mounds, and more. Some of the new foods include cheeseburgers, scrambled eggs, pies, chocolate, butter, cake, and cheese. Cactus Craft: Allows you to craft weapons, tools, and items out of cacti. Beekeeping: Adds bees and beekeeping to the game. - This mod adds new multiple possibilities and features to your wolves, including naming them, equiping them with backpacks and other clothing, allows to create new wolves with new textures, sizes, and speeds, and breed wolves. - This mod adds multiple customizable skins to every mob in order to give more variety to the game and make the gameplay more dynmaic. Each mob can have between 10-20 new textures! 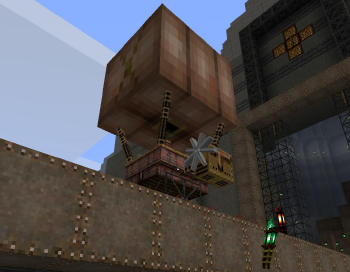 - This mod changes the way glass, bookcases, chests, and sandstone work so that they connect together and remove the borders in between them, making for more dynamic buildings and structures. - Adds new features to farming such as growable pumpkins, watermelons, flowers, new types of crops, fruit trees, and other types of plants. - A completely revamped version of Minecraft called Adventure Mode, in which you can't place or destroy blocks normally. This mod allows the the construction of dungeons and other interactive levels using intricate building tools and features in a cuboid-like-environment. Things like spikes, locked doors, keys, hearts, bombs, boomerangs, new mob combat, and other rpg like items and functions are also available. 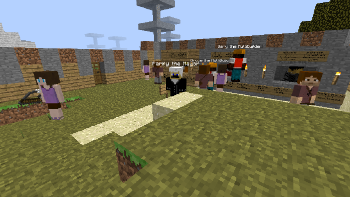 - This mod adds a variety of actual human NPCs to the game, including bandits, rogues, settlers, miners, herobrine, knights, samurais, hunters, and many others. - This mod addes dozens of new features including working windmills, light bulbs, cement, dispensers, cauldrons, new crops, mills, ropes, gears, saws, and more. - Adds actual working air planes to the game, crafted together from various parts in a custom crafting table. Includes 5 different airplanes, each with it's own specially ability, including firing bullets, dropping bombs, and seating 2 passengers. - The Great Wall Mod is a wall, road, and building generator. By default it creates terrain-spanning structures resembling The Great Wall of China. 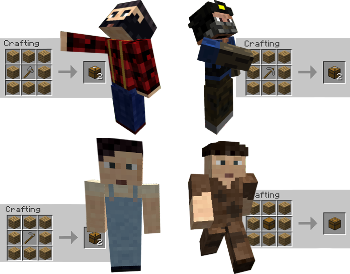 - This mod gives you an ability to create and manage your own colony in Minecraft by adding 4 new, self-sufficient AI NPCs, each with his own profession (lumberjack, miner, delivery man, and farmer), special abilities, and functions. - Adds a variety of new items, weapons, and blocks craftable in a 2x2 working space. - A variety of mods that add new graphical improvements to the game, including things such as bumpmapping, specular light, parallax occlusion, depth of field, weaving wheat/ grass, and toon shader. - Adds the ability to craft several kinds sloped blocks ingame for decorative purposes such as roof building. - Improves many things such as the rendering of visible chunks to greatly optimize performance and increase your FPS and even improve TNT explosion and make it cause much less lag. - A revamp of the way the world works by making trees automatically drop saplings and plant themselves and grow, spreading across the land. Other organic blocks such as mushrooms, flowers, cacti, and pumpkins also plant themselves. - This mod adds pre-generated villages to the game with actual interactive NPCs, each with his own special job and building function. NPCs can be traded with and are also self sufficient and will continue to improve and develop their village by building things such as a small castle, farm houses, barns, blacksmiths, windmills, taverns, and improving their current homes. - This mod fixes the sides of grass blocks to match the biome-colour on top. In addition, the famous BetterGrass mod is included, though remains optional. - Makes 'shining' items (Torch, Glowstone, Glowdust, Lit Pumpkin, Redstone, Lava Bucket, powered Minecart) illuminate everything around them if the player has them equipped, they lie on the ground, another player has them equipped in Multiplayer. - Adds the ability to create a working portal gun from the game Portal, as well as other various portal related items, such as companion cubes, knee replacements, and energy balls. - Adds 3 dragon mobs to the game, 1 of which can be tamed and ridden. PlasticCraft: Adds a variety of new items to the game, such as water bottles, microwaves, and plexiglass. HiddenDoors: Adds four "hidden" doors that take on the texture of what they were created with. MoreFlowers: Adds 6 new flowers to the game to liven up your map. Gemblocks Fix: Fixes Iron/Gold/Diamond blocks to have side and bottom textures like they used to a long time ago. Torches Anywhere: Allows you to place Torches on any surface, including glass. Portable Workbench: Creates a portable workbench to use on the go from your inventory. - Adds various new crafting materials and modern dayish equipment and blocks. - Adds 6 different throwing spears, each with its own special ability. - Optimizes the way the fog is rendered to reduce FPS lag. - Adds actual flying, maneuverable airships to the game, each with it's own ability. - Adds two new mobs to the game (tortoises and trolls) each with its own special ability. - Much like the MineColony mod, this mod implements multiple AI NPCs, each with his own special ability, such as: constructing actual buildings, exploring, setting up shops and trading, and much more. - Adds dozen of new commands to the game that allow you to do things such as spawn mobs, get items, heal yourself, teleport, set time of day, spawn, and many more. - Adds 46 new items to the game out of which, 24 are edible and the rest are used to craft these new foods. - Implements a whole lot of new items and features into the game, including actual guns, flame throwers, bombs, sentries, night vision goggles, a grappling hook, and much more. - Adds a new shears tool that allows for fast cutting of leaves. BlockPainting: Adds the ability to die several blocks to your liking. ElevationGradient: Increases the darkness depending on your elevation. The deeper down you go, the darker it will get. - Adds more than 20 new painting spaces, including a few special ones such as 5x5 or 1x4. -Adds a minimap to the top left corner of your screen (ground work by MrMessiah). Some of the features include adding multiple waypoints, NSWE directions, and current position coordinates. Well, this took a while to edit...have fun! If the pictures appear out of place, its because of the format, which dosent let me arrange it properly. This is awesome Niko, let's be sure to update this as much as possible.